Weight loss, whether you are bedridden or not, is achieved when you create a deficit between calories taken in through food and calories used up through activity. 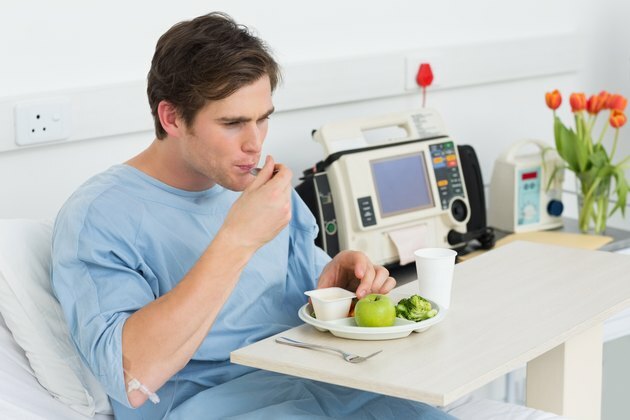 When you are bedridden, you can limit your calorie intake according to your doctor's instructions and you can perform isometric, non-movement, exercises to maintain your muscle tissue. These exercises will help you use calories and if you restrict your calorie intake by approximately 500 calories each day. Within one week, you will lose one pound. For every pound of weight lost, you have lessened your calories by 3,500. Eat a variety of healthy foods. Choose fruits, vegetables, whole grains, lean meats and fat-free dairy products as part of your healthy eating. Restrict your portion size by 10 to 15 percent. Leave food on your plate and do not feel you have to finish all the food that is placed in front of you. Eat breakfast. Eat smaller meals throughout the day to keep hunger at bay so you do not binge eat. Perform an isometric leg exercise. Lie on your back with your legs straight. Tighten the tops of your legs to pull up your kneecaps. Hold the contraction for five to 10 seconds. Release and then repeat two to four times. Perform an isometric stomach exercise. Lie on your back with your legs straight. Place your palms on your stomach. Exhale and tighten your stomach by pulling your belly button toward your spine. Maintain the contraction for five to 10 seconds. Inhale and release as you feel your hands rise. Repeat two to four times. Use isometric exercises for all the muscle groups of your body. For example, squeeze and release your glutes, your calves and your chest. Speak with your doctor regarding the best exercise program for you.